Sterling Ridge Resort offers more than just log cabin lodging. Sterling Ridge is your “home away from home” to view Vermont Fall Foliage. The Vermont Fall Foliage is so beautiful in Vermont that it attracts people from all over the world to view the amazing display of colors in the Green Mountains. Red, bronze, orange and yellow draw the spectator into natures mesmerizing show. The colors have drawn the attention of artists, writers, authors and magazine editors. Sterling Ridge Log Cabin Resort now has 23 cabins, the Field and Stream Dream Cabin and our “flagship”, The Mansfield House (the original 8 room B&B). Changes have occurred over the past 25 years but what has not changed is your front row seat to view Vermont fall foliage. 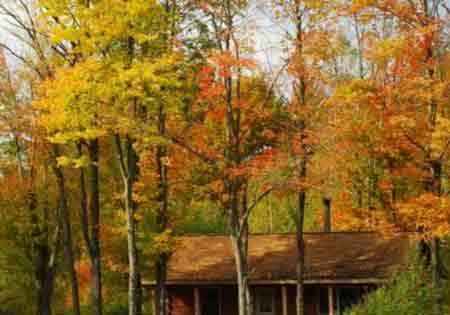 Let the covered porch of your own log cabin be the perfect spot for Mother Nature’s vividly, enchanting show of color!